After reciting Tashahad and Surah Fatiha, Huzoor said: It is the 27th May and as every Ahmadi knows that after the demise of the Promised Messiah (peace be on him), Khilafat started in Jama’at Ahmadiyya and in that regard, Jama’at celebrates this day as Khilafit Day. We thank God for His promise, Holy Prophet Muhammad’s (peace be upon him) prophecy, or for the glad tidings given by the Promised Messiah (peace be on him) for the second manifestation of the divine power. God saved us from disintegration and threaded us together. With this reference, we also promise that we shall be ready to offer all kinds of sacrifice for the establishment and continuation of Khilafit in Ahmadiyyat. One hundred and eight years’ history of Ahmadiyyat bears testimony to it that generation after generation sacrificed steadfastly to fulfill this promise. God will always provide the capability to every current or future member of the Jama’at to carry out this promise. The Promised Messiah (peace be on him) said that the purpose of his advent is to bring humanity closer to God, fulfill all obligations to God and to each other. In the treatise “Al-Wasiyyat” also, after telling the good news of the establishment of Khilafat, the Promised Messiah (peace be on him) has told us to make these very things a part of our lives. So he says elsewhere in the same writing that if you bow completely before God, I tell you, according to the will of God, that you will become a pious community of His. Set your hearts to the Greatness of God and show His oneness not only by words but also through actions so that He blesses you with His bounties practically. The Promised Messiah (peace be on him) told us to refrain from rancour and treat mankind with true sympathy. Show nobility in every way, you don’t know in what way you will be saved. If we stay with oneness of God and progress in the sympathy of mankind, be connected with the Khilafat in Ahmadiyyat, then we shall see all the progress that God has promised to the Promised Messiah (peace be on him). The Promised Messiah (peace be on him) got the glad tidings from God and told us that we shouldn’t think that He will allow us to go to waste. “You are a seed sown by His hand”. God says that this seed will sprout and grow and its branches will spread in all directions and it will become a big tree. There is no doubt that the Community established by the Promised Messiah (peace be on him) will progress. This is His promise. All of us will have to examine ourselves that what we are doing about our obligations to Him and our fellow beings. The world is watching us. Allah has given us this responsibility to establish onenes of God. We should get closer to God ourselves and help God’s creation to do the same. And set the human values on sound footing. In the past few days I was visiting Scandinavian countries. There, the news correspondents and other educated people as well asked the question that what are our objectives. I kept on telling them that the objectives of Khilafat and the Jama’at are the same for which God sent the Promised Messiah (peace be on him). And they are to try to bring humanity closer to God and to serve humanity. We don’t have aims other than that. We observe that the world is forgetting God and generally service to humanity is done to further own interests. This is creating more unrest. The relations among the countries and nations are drifting apart. By the grace of Allah, during these travels, there were many interviews with the media. There were two receptions held in Denmark and Stockholm in which we talked about Islam, the true Quranic teachings, the exemplary conduct of Holy Prophet (peace be upon him), and examples from the Rightly Guided Khulafa. Most people expressed openly that they then became cognizant of the real teachings of Islam. This is how the people express themselves in the meetings, conferences and symposia held by the Jama’at these days in the name of peace. That at differet places in the world, in one way, on one topic, in the west as well as in the east, in the north as well as in the south, Jama’at is trying tirelessly … is all due to the fact that they are connected with Khilafat and work according to its directions. After the Promised Messiah (peace be on him), the continued system of Khilafat not only guides its followers but also shows others, including the opponents of Ahmadiyyat or those who are afraid of Islam, the true examples of Islamic teachings. I present here some highlights of how others are impressed when they attend the meetings held by the Jama’at. There was a reception in a hotel in Denmark in which some members of parliament were in attendance alongwith the minister of Culture and Religion, Mayor, politicians, learned people and representatives of embassies. All expressed, without exception, that they learned the true teachings of Islam. There was a Danish guest who said that he was extremely satisfied by listening to the speech of the Khalifa. He was happy because such a message was urgently needed during these days and that he prayed that the Khalifa’s words are truly understood in Scandinavia. Mayor, politicians and learned people from another Danish city were also visiting and a member of their council said that the Khalifa’s speech was very impressive and he was happy that hundreds of thousands of Muslims were fearlessly standing like a bright beacon of light only for the sake of bringing peace in the world and they are the Ahmadis. One of the guests said that after his speech, all the people sitting at the stage with the Khalifa were talking with the true understanding of Islam. All were saying that it was a matter of pleasure that Islam has been very beautifully presented. Danish people do not know that there are many sects in Islam that desire peace. The guest said that he deemed it necessary that today all guests will go home with a new determination – especially in Denmark, where a sketch of the Holy Prophet (peace be upon him) was made with a wrong perspective. I told them that it will create hatred, peace will be disturbed, destrucion will ensue and nothing will be gained. They accepted that though its a sensative issue for them to talk about the sketches but the way I have explained, they liked it and have understood very well. A guest said that after today’s address the public opinion about Muslims will definitely change. He said that he had ordered for a Holy Quran to understand Islam better. After this evening he has realised his lack of knowledge and told that he will study The Quran. As I said that people came from Nogsko and that they were going back after the function. One of the guests wrote that they are very thankful that this conference will be remembered as a memorable event and experience. He further said that on their way back there was a special atmosphere in the coach. Throughout the journey there was a discussion on the topic of the conference. Everybody agreed that they spent a nice day and learned a lot. A reporter expressed his emotions by saying that he learned much, and the Khalifa’s speech forced him to think especially about the image of Islam presented by the media which is quite different from the reality. He said that he cannot find any fault with what the Khalifa said because everything that he said was about love and respecting each other. And the Khalifa told that these are the key to peace. He said that he has told us about the danger of another world war and that he is now worried that he heard a couple of people saying that we are close to a world war but he did not believe in it. Now his ideas have changed and he has to think seriously about it. He said that the way the Khalifa has presented will make him think. Then another attendee says that his (Khalifa’s) words forced her to think but she was worrisome in a way because he presented a grim picture of the future. He warned us about the dangers of a war and said that now is the time to work for peace otherwise we shall regret afterwards. A Danish lady said that before that day she had negative ideas about Islam but what she heard that day was good and a message full of love. She learned that ISIS is not Islam. Islamic teaching is to protect all places of worship. She said she met such a person who proved that the media presents a wrong picture of Islam. She was quite excited that a person has told her the meaning of Jihad. She liked his ideas about freedom of speech and bringing peace in this world. Then a Danish guest said that the Khalifa referred to the Quran, which shows that his words were not his own but were based upon reality. He said that integration for the Muslims in the West was possible because what he said proves that Islam is not opposed to the western values. Peace, tolerance and respecting each other were common values. Then he said that truly speaking, Danish people are afraid of Muslims and the Middle East wars. But at least after today we have understood that whatsoever is happening there is not the fault of the Holy Prophet (peace be upon him) or his religion but rather his teachings have been mutilated. A university student said that points of the function were clear that the Islamic values expressed there were such that we should all follow them. He further said that the Khalifa has made the objectives of the Jama’at Ahmadiyya very clear and proved that Islam is a peaceful religion by citing from the Quran, the life of the Holy Prophet (peace be upon him), and examples from his Khulafa. Another guest showed his feelings by saying that the Khalifa talked about our generation and solutions to the problems in an exellent manner based upon the Quran. At least he (the guest) did not know that the Quran tells that much about justice and then he said that his ideas have changed about Islam. Before, he knew only what media told him about Islam but now he has seen the reality. The Khalifa referred to a verse from the Quran that told about doing justice even to the people you don’t like. He also liked when the Khalifa told that the early Muslims treated the Jews and the Christians with love. This has touched his heart. Another member of Humanist Society says that people know very little about the peaceful message. Media brings forth only bad things and doesn’t tell anything about pleasant matters. All the Danish media should have been here today and that she was in despair at their attitude. Another Danish lady said that the Khalifa was her teacher, and that she was happy that she learned a lot today. She accepted that Islam is a peaceful religion. She wished that people pay attention to his message. She wished to get the Danish translation to absorb all those words, and convey to other people. Then she said that his message should be spread all over Denmark and they should agree with the message and learn from him. Before, she felt that all Muslims were terrorists but she is now regretful for having those ideas. Majority of them are peaceful. She told that her husband was forbidding her from coming here but I forced him to come, and now he is quite excited. She also said that the one who did not come despite invitation was a fool. A Danish politician said that that was his first time to meet a Khalifa. His experience with him was quite different from any other Muslim. The Khalifa made it clear that Islam gives freedom to all religions. He said that though your Jama’at is small but your message is huge. He also told that he learned that the Holy Prophet (peace be upon him) allowed the Christians to pray in his mosque and that he was against all kinds of anti-semitism. Representative of the American Embassy said that the Khalifa showed the true face of Islam and told that terrorists have no relationship with Islam. He said that he will tell the Ambassador about all the points including the grim matters that the Khalifa mentioned. A Danish teacher said that she would relate all that she learned to her students. She said that she did not know that Holy Prophet (peace be upon him) treated the Jews and the Christians very well. She further said that Islam and terrorism are separate from each other. 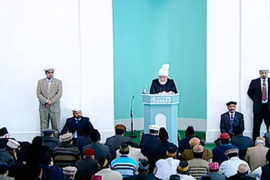 Another guest said that she observed from the Khalifa’s speech that he listened to other speakers very well. Then she said that Khalifa’s talk about third world war was thought provoking and she got a little nervous, but she got a kind of satisfaction from my address. In Malmo also more than 140 guests attended that included parliament members, Mayor of Malmo, police chief, representatives of the Swedish Church, university professors and people from different walks of life. A Jewish guest said that in this world negative thinking about Muslims prevails a lot. He said that he was surprised to hear a message of love and only love from a Muslim leader. He said that the Khalifa made me feel that Muslims are also our brethren and feelings of mercy increased in his heart about Palestinians and thought that may be that all of them are not bad. A lady who is a Christian priest and works in ahospital said that she thinks that it is true that people of Malmo and Europe are afraid of Muslims and mosques, but the Khalifa has convinced me about the objectives of the mosque and I hope that he will be sccessful in convincing others also. All his words were deep and meaningful. He gave the message that we should not be afraid of each other and should exchange our ideas. The best part of his speech was that mankind will have to recognize their creator and have firm faith in God. And this is my idea as well. Malmo Mayor said that the Khalifa assured us about the peace and made the objectives of the mosque clear. He said that they consider the mosque as a source of peace and integration. A journalist expressed surprise at the fact that we bore an extraordinary sum of 30 million Krona from our own pockets. He said that he has seen the incidents of terrorism and cruelty but we were different from those people. He related an incident in which a Muslim told him to go to hell becase he was a Christian but these things are not found in Ahmadis. Two professors from Malmo universities praised my speech to be positively effective and containing the messages of love and tolerance. One professor who teaches Islam said that the Khalifa’s address was very interesting and the people were impressed and even demanded its copies. There were peple from different religions. One of the guests said that one sentence that the Khalifa said and he liked was that for the greater good we should put our personal interests on the side. One of our Polish friends living in Sweden said that the speech was complete in every respect. He said that he believes in God while most people living here don’t, I feel proud of meeting a person who has a firm belief in God. A Muslim guest from Yogoslavia said that he agrees with every thing that the Khalifa said because he defended Islam like no other Muslim could. A Swedish guest expressed his thoughts by saying that he has never heard of anyone defending Islam like the Khalifa. A politician said that he was really feeling peace there. A Christian priest agreed with the Khalifa’s speech and said that when the Holy Quran was read in the beginning, it had a shaking and spiritual effect on him. Another guest said that he felt like being in another world. The central topic was that we should take care of each other. Khalifa proved through Quran that religion was a matter of heart. A Swedish guest said that media tells that Islam is a violent religion but he heard quite opposite to that here. The Khalifa removed our fears and proved that Muhammad (peace be on him) was full of peace. Another guest told that she was afraid before coming here. Now she saw it very different there. She liked Islam’s teachings about the rights of the neighbors. Many people expressed similar thoughts. A parliament member said that Khalifa should represent from all platforms and peaple should pay heed to him. If anyone was afraid of Islam, he must have got rid of his fears now. One of them said that this speech should be given to Austrians because they have fanatically become anti-Islam. He also said that he liked the fact that Jama’t has no connection with politics and is only worried about establishing peace and that Ahmadis are trying to help people and rid them of difficulties. It was interesting to note that a mosque was demolished in the Prophet’s time proving that Mosque is a place of peace. There was a reception in Stockholm where six members of parliament came. One of them said that Khalifa has impressed upon them that they should not close their eyes to a conflict thinking that it will automatically be solved. He was thankful for that message. One of the guests said that there are powers in this world that want to keep people away from each other, but we have succeeded to unite them in every way. A Christian refugee from Iraq said that he never heard anybody talking like me in Iraq. The people there don’t present like the Khalifa does here. He speaks the manifest truth about what is going on in this world. Then a guest said that what Khalifa says, was told by every religion in the beginning. Every religion has the same basic teaching. If we have differences with Muslims those are based upon culture and not religion. The coverage by electronic and print media in Denmark is as follows. A national newspaper with 50,000 readers published the news of the function. A radio journalist interviewed me for 45 minutes and broadcast the same with verbatum Danish translation. The radio station has 25 to 40 thousand listeners. The TV also broadcast the news and it has 2 million viewers. Similarly through other media this message of Islam reched a total of 3 million people. Similarly in Sweden, by newspapers, radio and TV, there were six interviews conducted. In all, the message reached about 8 million people. The way the people expressed their feelings that I have stated, they came to know the reality about Islam. The people now know the Jama’at Ahmadiyya is connected with Khilafat and that is why it is fulfilling the rights of God and His people. So every Ahmadi should understand this basic fact that these rights can be fully delivered by attaching themselves to Khilafat. It is the real Khilafat that not only changes the fears of its own into peace but also changes the the fears of others into peace. I have described the gist of people’s feelings of fear changed into peace by attending our functions. Because it is the promise of Allah, His blessings also go with it and they cast their effect of the beautiful teachings of Islam on others. That is why some of them expressed their desire to read the Quran. Apart from Promised Messiah (peace be on him), if in these times, someone tries to, or wants to, establish Khilafat, he will fail and will not be able to establish peace. We observe what happened at the time of Hazrat Umar (may Allah be pleased with him), during the time of the rightly guided Khulafa. He brought that kind of peace in Syria and Iraq that even Christian there were happy with Muslim rather than Roman government. But what is happening there now. The movement that started in the name of Khilafat, had no power and whatsoever power was in the beginning has lost steam. It has been reduced merely to an organization in only about two to three years. It provided peace neither to their own nor to others. There are many there who went there with great fervor in the name of Islam and Khilafat even from Europe but got despaired when they saw the unIslamic actions. They are living there in a state of fear and despite their desires, cannot come back. An example will explain the state of violence there. It was reported that there was a lady whose little child was crying with hunger pangs and her home was far away. She went aside under a tree and started breast-feeding the child. The soldiers of the so-called khilafat came there, snatched her child, and killed this lady with bullelts for her unIslamic act of their brand of Islam. They have snatched the peace from their own as well as others. It is Ahmadiyya Jama’at that is changing the fear to peace for their own and others. It is being proved by other’s expressions that Allah’s blessings are with Ahmadiyya Khilafat and they never mitigated. Jama’t’s 108 years history bears testimony to that as I already stated. So the establishment of the Jama’t of Promised Messiah (peace be on him) and the Khilafat is a Divine promise. It is the same thing as it was at the time of The Promised Messiah (peace be on him). What some people tried to finish at the time of Promised Messiah (peace be on him) and it did not finish, they will try to finish even today, but by the grace of Allah they will never be able to do so. Huzoor then announced three Janaza prayers to be led by him later.